Thousands of Canadian students joined the Governor General and the minister of veterans affairs in France to mark the 95th anniversary of the Battle of Vimy Ridge. Thousands of Canadian students joined the Governor General and the minister of veterans affairs in France today to mark the 95th anniversary of the Battle of Vimy Ridge. "I think the reason why I stand here is because I can't thank them enough for making the ultimate sacrifice," said Aiden Campbell Wilkins, 16, from British Columbia. An estimated 5,000 students from across Canada attended the Vimy ceremonies. "It's wonderful to see that history relived through their eyes," Gov. Gen. David Johnston told CBC's Heather Hiscox. "We lost our last living survivor of World War I several years ago, so it's the responsibility of these young people to carry that story along, and they certainly are doing so." Johnston told CBC News that Vimy Ridge was a "very defining" Canadian moment. In his speech, the Governor General spoke about the careful, detailed planning behind the push for Vimy Ridge, calling it a military engagement unlike any other in Canadian history. The storming of Vimy Ridge began early the morning on April 9, 1917. The battle marked the first time that all four divisions of the Canadian Corps fought side by side. Some 150,000 French and British soldiers had already died trying to take back the ridge, viewed by allied commanders to be impregnable. By the fourth day, April 12, Canadians controlled the entire ridge at a cost of almost 3,600 lives. Thousands more were wounded in the battle, which was hailed as the first allied success of the long war. "We stand on hallowed ground — a place of agonized conflict, a site of appalling loss of life, a vessel of sorrow, a crucible of courage, a hallmark of ingenuity, collaboration and resolve undertaken by men at arms in the cause of peace," Johnston said. 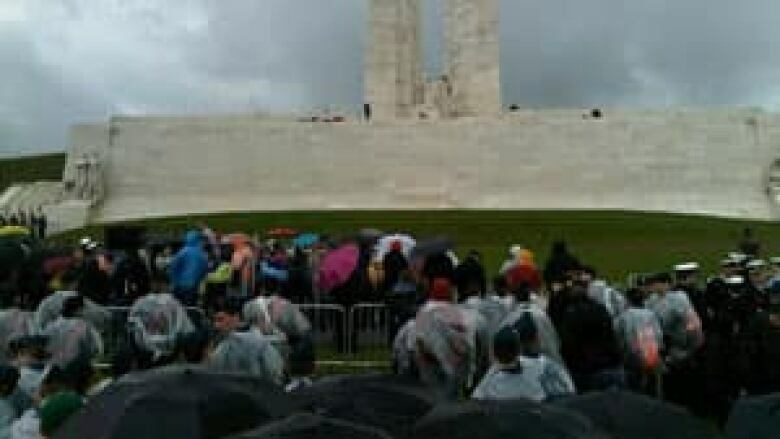 CBC's Susan Ormiston said many Canadians and others who came to the commemoration ceremony stood in the pouring rain for about three hours. "There was some wreath-laying, there was a lovely folk song, written about Vimy Ridge by an Albertan girl — she played her guitar on the rampart of the monument," Ormiston said. 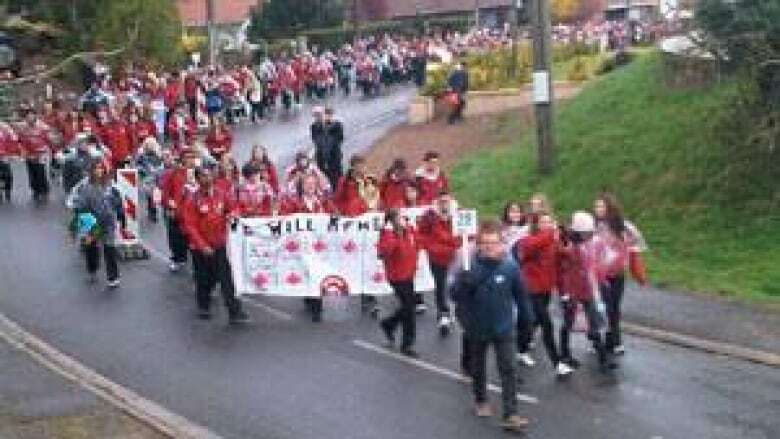 Earlier, roughly 4,000 Canadian students took part in a silent march from Givenchy to Vimy, Ormiston said. The students have been travelling to various historic sites, including tunnels in the nearby town of Arras, she said. Ormiston said a lot of the students spoke of the humility of the event, and how amazing it was to learn about young soldiers who fought at Vimy Ridge so many years ago. "When you look at the graves and it says that they're 18 years old, you can really feel it when they're your age and you just think on this day what it would be like to be there," one student said. Veterans Affairs Minister Steven Blaney, representatives from veterans' organizations, the Department of National Defence and the RCMP were also in France to mark the anniversary. Commemorative events were also planned in several Canadian cities, including Toronto and Ottawa. In Ottawa, Gen. Walt Natynczyk said he was thinking about the courage of young Canadians who fought 95 years ago, saying Canada came of age among its international partners because of the "courage and dedication" of the people who took part in the battle of Vimy Ridge. Canada's last First World War veteran, John Babcock, died at age 109 in February 2010.